This method is similar to the natural fermentation process we use. It allows the sugars in the olives to ferment and form lactic acid. The end result will be well worth the effort and the wait. All the wonderful flavours are preserved and this gives the olives its delicious taste. Green olives are soaked in a caustic soda solution of between 1,3 and 2,6% for ±15 hours. The time may vary according to the size and ripeness of the fruit. After a few hours, take out an olive and make a cut through the flesh. When the lye has penetrated two thirds of the distance between the surface of the fruit and the pit, it is ready to be washed. Also try to prevent the olives from coming into contact with air, as this can cause the colour to go dark or an unattractive khaki green. Keep in an airtight container (stainless steel, glass or high grade plastic will not affect the taste) through the entire process. In the mean time prepare the brine by dissolving 1 kilogram of salt in 10 litres of clean water. Now rinse the olives many times with clean, cold water to remove soapiness and caustic residue. This step is very important, because you don’t want your olives to taste of caustic soda or “soapy”. 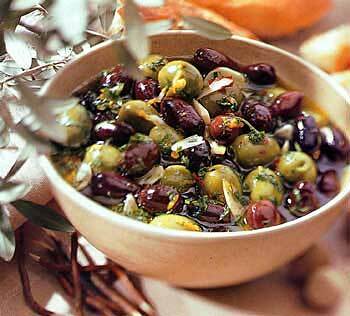 Place the olives into a suitable container and cover completely with the brine. Make sure the container has a tight fitting lid. Leave to ferment ±12 months. Taste them from time to time and decide for yourself when they are to your taste. Bottling: Remove from the brine, rinse with clean water and place into glass jars and cover with hot brine. To make the brine solution: 20g Salt mixed into 1 liter boiling water. Cover immediately and leave to cool. Store in a cool place and refrigerate after opening. Wine vinegar may be added to taste. You may even add sprigs of fresh herbs like rosemary or thyme or a few cloves of garlic or lemon slices. There are two popular ways to prepare the Dirty Martini: Stirred or shaken. Purveyor of the second class is the famous gentleman who goes by the name Bond, James Bond. We at INOLIVIA are supporters of the first class (stirred). Although the differences are consider minor, we beleive the stirred way does make a difference. Pour the vodka, dry vermouth and olive brine into a frozen glass with a handful of ice and stirre well (about 20 times) with a long spoon. Strain the contents of the glass into the cocktail glass and add the olive.